∙ Welly boot and shoe storage rack hand-crafted in FSC approved Pine. ∙ Holds 5 pairs of welly boots and 5 pairs of shoes or walking boots. ∙ Hold your wellingtons upside down to keep them dry and allow them to air naturally. 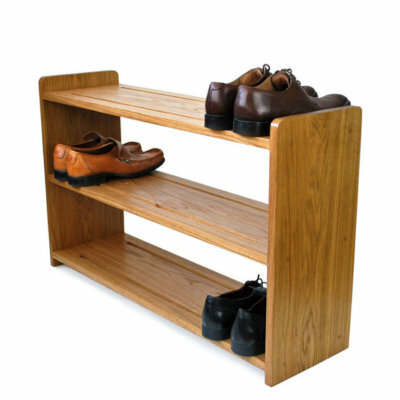 ∙ Slotted shoe shelf allows dirt to fall through. ∙ Supplied varnished and ready assembled. As with everything here at Boot and Saw, our welly and shoe racks are designed and manufactured by hand using the best quality FSC approved timber available, so you can be sure your welly rack will last. Each boot and shoe rack is constructed with meticulous attention to detail, and then treated to withstand the elements should you wish to leave it outside, having been finished with hard wearing yacht varnish. Our racks are also suitable for riding boots and waders. Also, there’s no assembly required, simply unpack your rack and you’re ready to go. 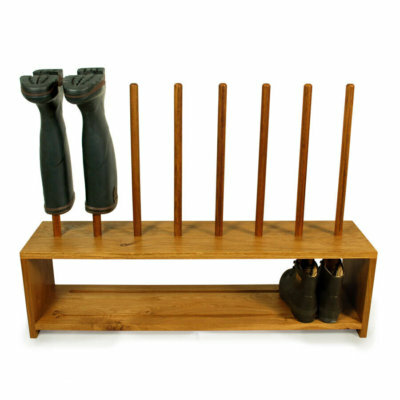 Our welly boot and shoe racks are also available in solid Oak. Visit the shop to see more of our boot racks and welly stands or contact us for a custom request. 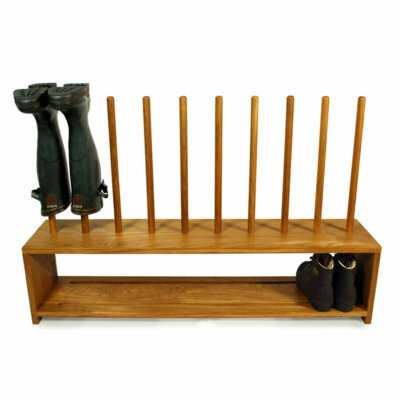 Great welly and shoe rack – sturdy and beautifully made. I’m delighted with it! This is a sturdy, well made, high quality product. Very happy. Thank you. Fantastic. Thank You. Great design and very well made. Brilliant. Finally all the boots and wellies for my family are kept neat and tidy. Perfect – Thank You! Boot rack arrived on Tuesday. It is perfect! We received our custom made welly rack yesterday and it is now wall mounted and doing it’s job perfectly. Thank you for being so helpful and prompt. Thank you for the lovely boot rack you sent us. It is a unique piece here in Belgium. Fantastic boot rack very well made and looks of a high quality. Fast delivery and excellent customer service. Would highly recommend! I have taken delivery of my pine welly stand . I am really thrilled with it and very much appreciate your workmanship. Welly boot rack looks good and seems to be holding up well outside. Arrived quickly too. Thanks! 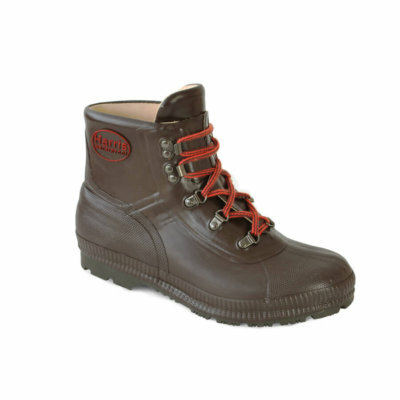 My new Aigle boots have arrived this morning and they fit perfectly – love them – and….its raining today! yay! I am off out in them right now! Thanks for your help. Your details are safe with our secure shopping cart powered by Barclays and Trustwave SSL. Use your Credit/Debit card or Paypal. Copyright Boot&Saw 2019. All Rights Reserved.